OnlineWorkSuite Toolbar is an application that promises to make it possible to edit various documents. Judging from the appearance of OnlineWorkSuite Toolbar, it is a legitimate application, so it does not surprise specialists at all that so many users willingly download and install it from the web. If you are one of them, we have to upset you by saying that you have made a huge mistake. This application is not trustworthy, and its presence on your computer might put your computer in danger. Luckily, you can make sure that this does not happen – go to implement the OnlineWorkSuite Toolbar removal. You must erase it as soon as possible because the longer it stays, the higher are the chances that it will cause trouble. How does OnlineWorkSuite Toolbar act? 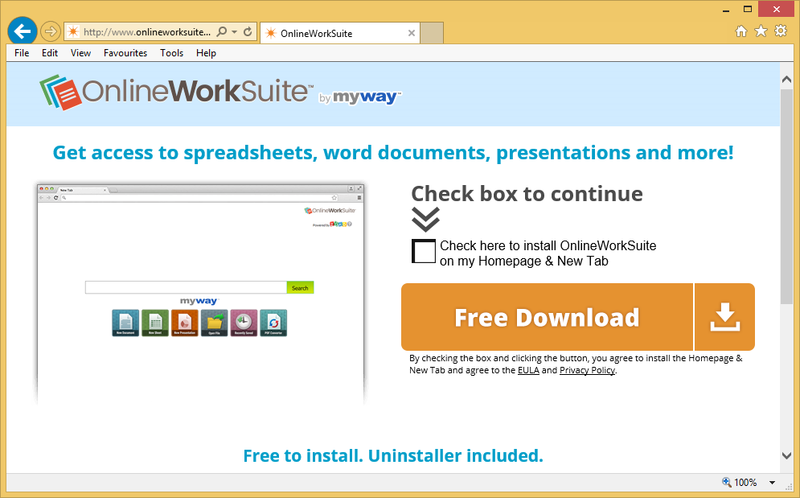 OnlineWorkSuite Toolbar is promoted as a document editing application, but it is not exactly what it claims to be. Instead of acting very beneficially on users’ computers, it simply sets a new page looking like an ordinary search tool in the place of the homepage and default search provider. It contains such buttons as New Document, New Sheet, Open File, PDF Converter, and others opening a third-party document editing tool. This online tool can be accessed without the help of OnlineWorkSuite Toolbar, so there is no point in keeping this application installed. Actually, it might be even dangerous to keep it, so you should implement the OnlineWorkSuite Toolbar removal as soon as possible. Its main drawback is that it records various details about users, their activities, and their machines. Then, it sends this information to third parties, so the chances are high that the gathered data will be used for malicious purposes. Its second drawback is associated with the search tool it contains. Although it looks trustworthy, it returns search results with tons of commercial advertisements. These ads might redirect to malicious websites quickly. Frankly speaking, there are more disadvantages related to OnlineWorkSuite Toolbar than advantages, so its removal is mandatory. How did OnlineWorkSuite Toolbar enter my computer? OnlineWorkSuite Toolbar has not appeared on your system out of the blue. You have it active on your computer if you have downloaded it from its official website or some kind of third-party page. This undesirable program could have also entered your system illegally too. This usually happens to those users who download tons of freeware from the web. Of course, it does not matter now why this program is installed on your computer because you still need to uninstall OnlineWorkSuite Toolbar from your system today. How do I remove OnlineWorkSuite Toolbar? You should delete OnlineWorkSuite Toolbar from your computer as soon as possible because it is not as beneficial as it claims to be. We are sure you will find to install a trustworthy application in the place of this browser plugin, so get rid of it without hesitation. You can go to delete OnlineWorkSuite Toolbar either manually or automatically, but the quicker way to get rid of it would be to scan the system with an automatic tool. If you still decide to remove OnlineWorkSuite Toolbar manually yourself, start its removal by resetting your browsers.